Here’s a piece of personal history. Chrome-radiatored 1948 Daimler CVA6, with a stylish Welsh Metal Industries L57RD body. No. 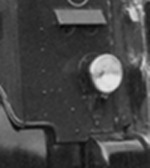 70 was operated from new, lasting in service from December 1948 to December 1957. One of a pair, the other one was No. 71 (FVJ 364), which I never saw. Looking fairly new, but near the end of its life, it’s outside RAF Creden Hill, Hereford, where I was stationed for three months in mid-1956. Note the tree damage to the front dome. You can see the shiny pre-selective gear lever below the steering wheel. It had no gate, merely sliding forwards/backwards, gears indicated as RN1234, like the maker’s cars of the day. Having grown up in Daimlerland, South-West London, I was entirely at home re-living old memories on the varied Yeomans Daimler CW/CV fleet, which included some austerity models. Yeomans still exist, for a while named Yeomans Canyon Travel and now simply Yeoman’s Travel. They gave up their stage services a long time ago. As for the bodybuilders: Welsh Metal Industries, of Caerphilly, was created for aircraft production purposes during WWII, but, once peacetime came, there was a need to produce something else. Like some other former aircraft manufacturers, they turned to bus bodywork and did good trade for a while, so desperate was the need for new vehicles. Building on past experience, the WMI body was radically different in its substantial use of aluminium, resulting in a very light structure. The bodies, however, were somewhat fragile, with horror stories of windows falling out and beading strips flapping around in the breeze! I don’t recall any creaks or groans with this one, but perhaps the body had been completely rebuilt by then. Note the large number of obtrusive rivets/screws! That front dome – damaged or not – reminds me of Northern Counties or Weymann styling. What livery did the operator use in those days? Dark Green and Cream, Pete. The seating capacity seems rather high for a 1948 lowbridge decker. Most, of that period seem to have been L53R. I wonder if there was an additional row on the top deck or if a couple more pairs had been fitted on the lower deck. There couldn’t have been much legroom wherever they were squeezed in! Far from having "given up their stage services long ago" Yeomans Travel (note: Yeomans not "Yeoman’s" (the family name is "Yeomans") the company still runs a wide range of local bus services based on Hereford and with its associated Leominster-based Lugg Valley Travel is the biggest LBS operator in Herefordshire. I was wondering about the seating. I have been trying to work out if the cab has been shortened to increase seating. It seems to require an athletic user, anyway: possibly the door is open, like the window vents for a hot day. The step seems to start well up: the driver seems to have this big upward step and then an unassisted leap forwards and upwards. There seems nothing to assist him. Do some have more of a panel behind the door? If you push the driver forward, then can you push the upstairs front bench seat forward too? Perhaps in that rural part of the world, they employed ex jockeys to drive? Well, I was at RAF Credenhill in 1956 from April to late June, too and regularly travelled on Yeoman’s buses. I actually took a not wonderful picture of the Daimler CVD some three years earlier, never dreaming I would be posted there. Jim Davis’s point regarding the family name of ‘Yeomans’ brings me to ask about something that has puzzled me for quite a long time. Why was it that the more modern day company name comprised the name ‘Canyon’ when the village where the company originated had the spelling ‘Canon’ (as in Canon Pyon)? Perhaps because "Canyon Travel" has a more attractive name when the company dealt with holiday tours! The 1881 census shows a Henry Yeomans family living in Canon Pyon in 1881,, so they had some history in the village. The Omnibus Society has photos of an eclectic mix of their vehicles, including a Leyland Titanic, Sentinel and double-deck AEC ‘Q’s’. I know that the Ministry of War Transport gathered a lot of the Q’s from operators who had bought single ones of this type. They were possibly the largest operator of the type at one time. See HERE: http://theomnibussociety. 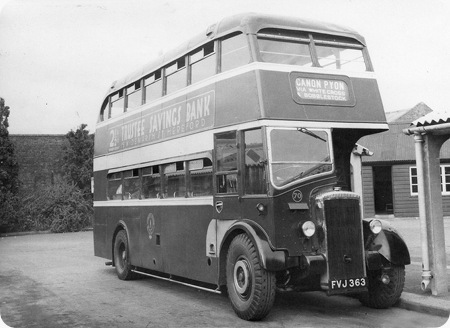 I should have mentioned that they also operated a wartime Bedford OY 3-tonner lorry with a bus body on it behind the cab! Very rare! There is a photo of it on the OS site. Way back when, Chris B and Joe were puzzled about the seating. Bus Lists On The Web has this bus as L30/26RD. Leaving aside the discrepancy of one, this reveals that the extra seating is in the upper deck. Welsh Metal Industries didn’t only build complete bus bodies but also components for bus bodies, notably for Beadle. WMI being part of the same group as Sentinel resulted in the latter using Beadle body designs and patents in order to utilise WMI components.